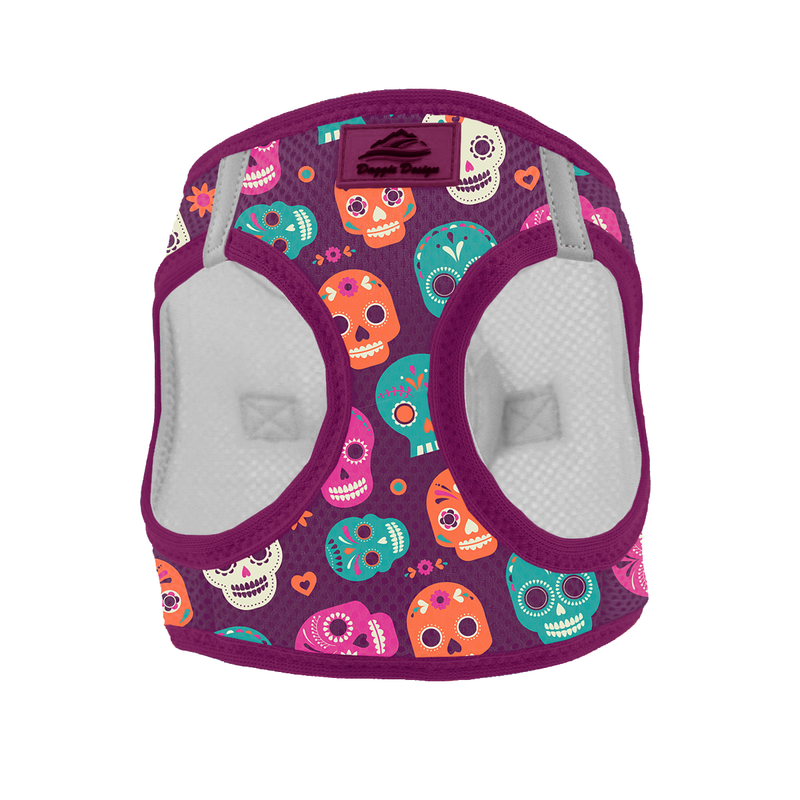 Get your favorite Doggie Design harness in a limited edition Halloween print with the American River Choke-Free Sugar Skulls Holiday Line Dog Harness! Reflective strips for night walking. Made of 100% polyester mesh. 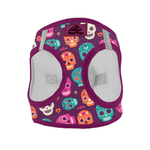 The famous features you love in a safety harness are now available in a fun Sugar Skulls Halloween print! It's also perfect for The Day of the Dead! The American River Ultra Choke-Free Mesh Dog Harness protects pets' vulnerable airways by distributing all pulling pressure over the chest - not the neck. This is particularly important for teacup and small dog breeds prone to damaging their tracheas. Though gentle on your pet, strength is not sacrificed. The double safety closure has touch fastener and a high-strength plastic side release buckle. This harness also includes a Double D-Ring leash attachment for an additional level of strength and safety when used with a leash. Simple and easy to use! Have your pet step in the leg holes, wrap the fabric up and around the back, smooth the touch fastener and clip the buckle. When using with a leash, clip through both D-rings. Do you have a hard-to-fit dog or cat? This harness can be customized with wide touch fastener fabric that can be swiveled at an angle to adjust to most any pet. Experiment with the angle of the hook and loop fabric to find the best fit to prevent any gaps in the fabric. This will keep your pet safe and comfortable. The mesh fabric is sturdy, soft, and breathable, making it ideal for most any climate. Reflective strips are included for better visibility in low-light conditions. This Ultra Choke Free Harness is the perfect design for use as a dog seat belt harness to keep your pet from interfering with your driving. The choke-free design will provide your pup extra safety in the event of an accident. Made of 100% soft mesh polyester. Machine wash and line dry. Posted On 03/10/19 by Lisa B from Grand Prairie, TX Yes, Lisa B recommends this product! This harness is well made. Fits my baby perfectly. The only reason I did not give it 5 stars, is because it does not look like the picture. It's more faded and the skulls are blurry. But other than that - it's a great harness. Posted On 01/08/19 by KK from , TX Yes, KK recommends this product! Very cute and fits my chihuahua mix in a Large (he's a big boy). Unfortunately, it is pinkish and not maroon, and the skull images are blurry, not sharp like as pictured. My pup doesn't really care for the girly look :D, but he does like the comfort and fit. The neck sags a bit. He is wearing it right now. It was a deal on sale, so will keep it, or give to a shelter. I might re-order in another color. Posted On 10/22/18 by Lubbock from Lubbock, TX Yes, Lubbock recommends this product! I ordered a medium for my 13 pound poodle mix and it was too small so I am returning and ordering a large. It is well made and a great value. Posted On 09/26/18 by Michelle B from Huntsville, AR Yes, Michelle B recommends this product! Love this adorable harness, good quality at a great price, sizing is perfect! Always on time. Quality merchandise. Very happy. They never disappoint.